In the STORM logical architecture, the main architectural components are shown which are integrated for enabling a complete set of services and tools. UAV-based sensor infrastructure for surveying, diagnosis and monitoring open-space Cultural Heritage. A novel induced fluorescence sensor to provide early detection of biofilms developing on the artefact surface and insight into the physicochemical structure of heritage materials and objects. A Wireless Acoustic Sensor Network featuring high-fidelity microphones to capture the full spectrum at high SNR, processor/DSP to pre-process/process/analyse the signal, smart energy management, and OTA upgrade capabilities. Installed applications on personal mobile devices for crowdsensing and crowdsourcing applications, appropriately designed to support, correspondingly, the human sensors in the field and STORM stakeholders. Existing information systems that provide data and information, to identify and integrate according to the specific applications of the system, using appropriate adapters. A multimodal data flow is collected from these data sources. Leveraging on innovative techniques for extracting and filtering features and information, only the “relevant” data for the specific STORM domain (Information Fusion Services) are identified, selected, and processed. To this end, the project uses and combines techniques, technologies and innovative approaches to image recognition (collected by UAVs) along with models and techniques of information fusion. The integration and correlation of the extracted information, along with the representation through the available Knowledge Models, produces one or more domain events to monitor, control, prevent, etc. 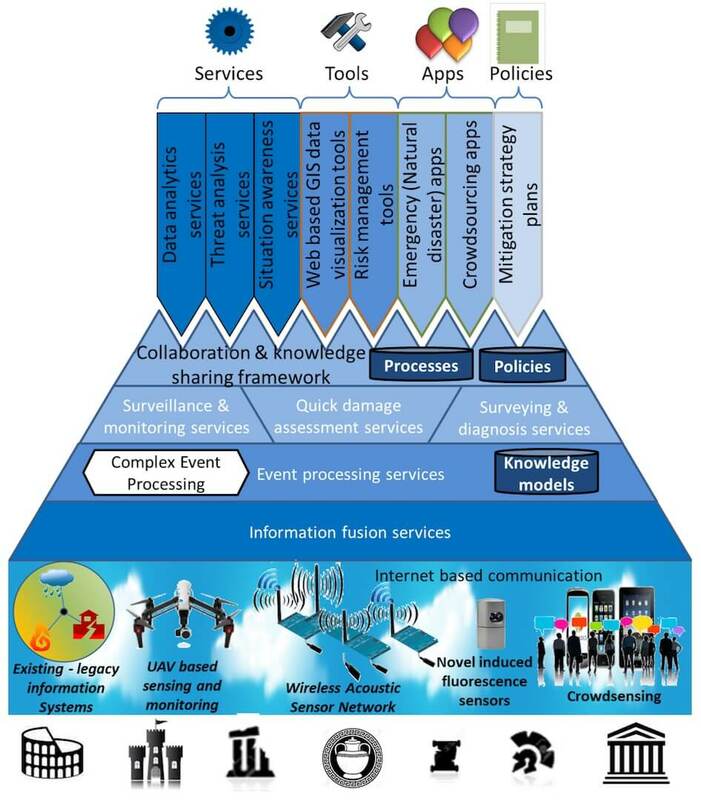 Exploiting Complex Event Processing techniques and technologies, the extracted information and/or the deducted/determined domain events, are aggregated and correlated each other in order to bring out potential dangerous or critical situations, ranging from the recognition, validation and localization of signals and events that may suggest the need for monitoring, surveying or warning for disaster prevention, assessing the level of risk, etc. (Surveillance & Monitoring Services, Surveying & Diagnosis Services, Quick Damage Assessment Services). Based on the detected critical situations, a team of experts (structural engineers, archaeologists, geologists) collaborate and cooperate in order to understand the causes and find the most adequate response. For this reason, the project also provides the system ability to handle decision-making processes that can respond appropriately to situations of recognized danger. This includes both automated reasoning mechanisms (allowing the system to react and/or act independently) and a collaboration and knowledge-sharing framework (for careful and accurate cooperative design and planning the actions as effective and as unobtrusive as possible). General information (e.g. guidelines, reports, etc.) related to dramatic events (e.g. flood, earthquake) are shared and dynamically adapted in near real-time by ad-hoc team of experts in order to save human lives and identify the most urgent recovery actions called for by the unforeseen emergency (Collaboration and Knowledge Sharing Community Framework). In principle, the STORM integrated platform deals with corrective actions of the following types: continuous real-time control, control of discrete on/off action based on event processing, cooperative planning and design preservation or restoration structural interventions, and quick response in emergency management. Crowdsourcing Services: applications used “in the field” for the generations of information (STORM crowdsourcing applications). These applications are able both to collect information provided explicitly by users, and to send notifications to users (for example, to report how to behave in situations of danger). Natural Disaster Applications: for desktop/mobile for the operational management of natural disaster, used by specialists in the field. Web-based GIS Visualization: GIS web-based services for targeted risk assessment and wide dissemination of their results along with the dynamic climatic and natural hazard data of each protected archaeological area. Threat Analysis Services: multidisciplinary evaluation (processes and technologies), of vulnerabilities that could affect the cultural site also as part of the overall Cultural Heritage ecosystem. Risk Assessment Tools: procedures and related application tools aimed at assessing risks associated to hazardous occurrences. Mitigation Strategy Plan: after event processes, planning and policies which define the actions to eliminate or to reduce the risk associated to the identified hazards.